Remember Sara Ali Khan and Kartik Aaryan's scene for Love Aaj Kal sequel that was leaked on social media? Yea, the one where we saw her enjoying a bike ride with the actor. While it was a mere scene from their upcoming movie, viewers were quick to point out a big flaw in those pictures and videos. Sara, who was riding pillion was not wearing a helmet. The actress was heavily criticised for setting up a wrong example and a complaint was filed under her name for violating traffic rules. Sara Ali Khan's Pretty NYC Pictures Will Make You Crave For a Vacation Right Away! 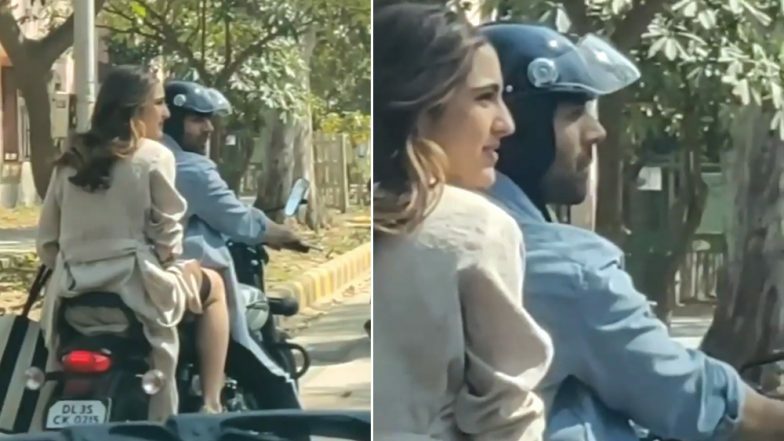 As per a report in News 18, Delhi police has asked for the details of Sara Ali Khan pillion riding without a helmet while shooting for a scene. A senior police official said that necessary action will be taken under the Motor Vehicles Act and they will ensure all the facts related to the incident are received, perused and verified. The matter intensified when a complaint was registered and the complainant requested that she should not be spared because of her profession. The police are currently investigating the matter. Kedarnath or Simmba - Janhvi Kapoor Picks a Sara Ali Khan Movie She Would Have Made her Debut in. Well, the matter will cool down eventually and we hope it doesn't intensify. Whoever said being an actress is an easy job. While she was heavily trolled for the entire incident, matter only got worse with this police complaint. Hopefully, it will get sorted in the next couple of days.